The Committee on Foreign Affairs of the European Parliament (EP) has adopted the final draft of the resolution recommending to suspend the accession negotiations with Turkey by large majority with 47 votes in favour and 7 votes against, in a new move to respond to an ever-deeper authoritarianism and the recent regime change towards a presidential system of government in Turkey. This draft constitutes an antithesis to AKP’s one-man system that disregards the achievements of the modern world. Although the ruling party underestimates this draft on the grounds that it is not binding, it is indeed significant for Turkey because it will provide a basis for the relations between the newly elected EP and Turkey during the next 5 years following the European elections on 26 May. Considering the possible new composition of the Parliament, it will become harder to make progress on issues such as visa liberalisation for Turkey and upgrading the Customs Union Agreement. Despite calls on Turkey to take concrete steps, the Judicial Reform Strategy Paper, initially expected to be finalised by the Reform Action Group in January 2019, is yet to be released to the public. The Reform Action Group did nothing but simply convene, without taking any concrete steps. Moreover, the case of Osman Kavala, who, after being detained in prison for 16 months with no indictment against him, finally received an indictment concerning the Gezi protests asking for an aggravated life sentence just the day before the hearing of his case before the European Court of Human Rights and the Court of Appeals upholding the verdict against Cumhuriyet daily indeed confirm the argument that Turkey’s judiciary has been politicised and show yet again that the rule of law has been destroyed. 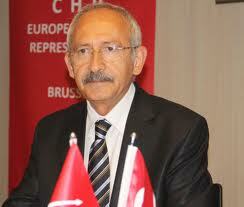 The AKP government is yet to grasp the importance of fundamental values shaping the main framework of EU-Turkey relations such as the Copenhagen criteria, democracy and the rule of law, so much so that it continued to reduce its relations with the EU to negotiating over the situation of Syrian refugees up until the day before the vote in the committee, threatening EU member states with the refugee card. As CHP, we see Turkey’s full accession to the EU as a prerequisite for modernisation and therefore embrace our bid for full membership to the EU. We’d like to reiterate CHP’s commitment to Turkey’s full accession to the EU as a “sine qua non” of Turkey’s resolve for modernisation.